Super oil absorbing soft, film-type paper sheet from Japan, wicks out dirt and sebum from pores, and turns clear when the sheet is full. 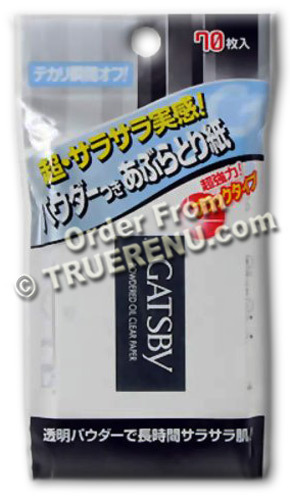 Powerful blotting papers from Japan, with English ingredients and usage instructions included. Gentle sheets remove excess oil, dirt, and shine all day long whenever needed. Blot away the perspiration glow after a workout. Soft film-type paper will not break (like other blotting papers). Great for oily skin, oily T-zone, blackhead or acne prone skin. 70 sheets in a neutral white paper carrying case. Oil thirsty papers are razor thin and light, yet they attract excess stuff on your skin like a magnet. Just press them on and lift them off, and the sheets tell you when they've had enough by turning clear! Toss them in your gym bag, pocket and desk so they're always handy whenever you need the signs of daily stress, oil, and grime removed in a hurry. Can be used as often as desired. Lay absorbent side down over desired area. Press gently for a few seconds and lift off. For best results, do not wipe or smear the sheets across an area. Film turns clear wherever oil has been fully absorbed. Dispose paper in trash - do not flush because it will not dissolve in water.